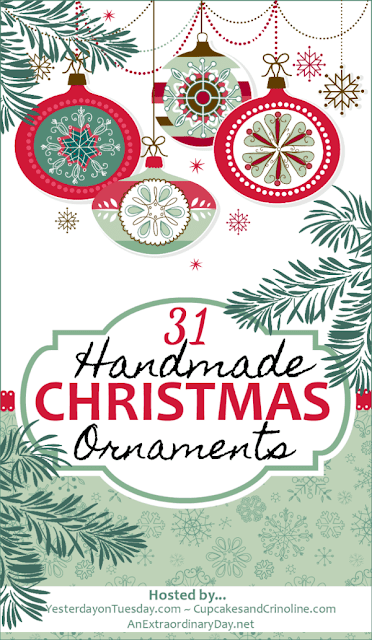 I know it's only the middle of October, but I've been doing a little bit of Christmas crafting, and I'm excited to share an idea for a homemade ornament with you. I've had a good reason for my early crafting--I was delighted to be asked to join a group of bloggers who are creating handmade ornaments all month long! Now, I'll have to give you some backstory for my ornament. I know it's not the most beautiful ornament you've ever seen. To be honest, my Christmas decorating follows more along sentimental lines than showy ones; you can take a look at my home decorated for last Christmas here to see what I mean. But even more than that, Christmas is a time when I think of my mom. How she loved Christmas! From the time I was very small, when our family had very little money, all the way through more prosperous times, my mother made Christmas at our house a time to remember. She taught me to do the same in my own home. (Click here to read a very special Christmas memory of her!) She died back in 1999, and I miss her most at Christmastime. Ever since my mom died, I've especially valued anything handwritten by her. I wish now that I'd saved every card and letter she ever sent me. It's not that her handwriting was special; it's just that it was a very particular part of her. I'd recognize her handwriting anywhere! Her friend Bonnie gave my mom this recipe for Date Nut Balls, and my mother made them only at Christmastime. Can you see how the recipe card is yellowed? That's partly from age, of course, but it's mostly from having been used a lot! I decided to make an ornament that would capture this wonderful Christmas memory. First, I made a photocopy of the recipe; the original is in my recipe box, safe and sound. 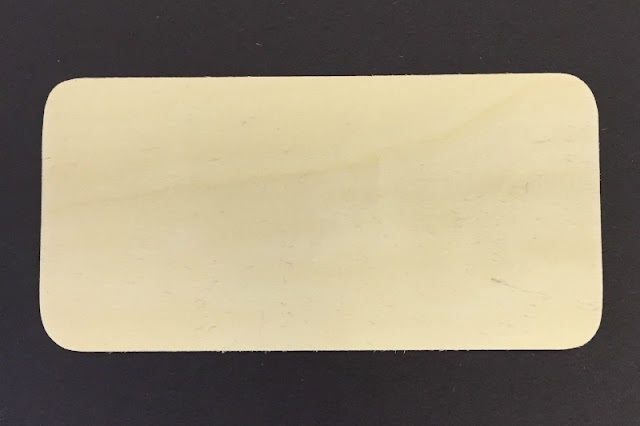 Then I found a simple piece of craft wood that was about the size of my recipe card. Nothing special here; any piece of wood would do. Since I made this I've found these pretty little wood plaques; I think they would work better. A piece of barn wood would be great, too. The process for making the ornament couldn't be simpler. I just decoupaged the photocopy of the recipe to the piece of wood using Mod Podge. Since my recipe card was close to the color of the wood, I left the wood untreated; you could also paint the wood, especially if you had a piece a little larger than your card all around. I added a Santa hat sticker in the corner for a bit of color and to commemorate the fact that my mother had a huge collection of Santas. The Santa hat I used was just a scrapbook sticker like this. To create a hanger, I hot-glued a piece of twine to the back of the card. That's it! You can see in this photo that I used glossy Mod Podge, because that's what I had on hand. If I were starting over, I'd use the matte finish Mod Podge; I think that would look better. As I said, it won't be the most beautiful ornament on the tree, but it will be full of the most beautiful memories! You could do the same thing with a special note, a card, or any other precious memento. You could make it as simple as what I've shown here, or you could really make it fancy. Or to be even easier, you could just glue a ribbon to the back of the card and hang it on the tree! The important thing is the memory and the way it will warm your heart each time you see it. Now, tell me: do you have a Christmas memory you'd like to capture in an ornament? I'd love to hear! I will earn a small commission. Your price will not be affected in any way. Oh, Richella, I adore this ornament! I know you will smile every time you see it on your Christmas tree this year and in years to come. I inherited ALL of my my grandmother's recipe boxes. I am going to dig them out of the attic and make a few of these for family members. I know that they will be well received. The memories we create during the Christmas season, aside from celebrating Jesus' birth, are what makes Christmas especially warm and meaningful to most of us. 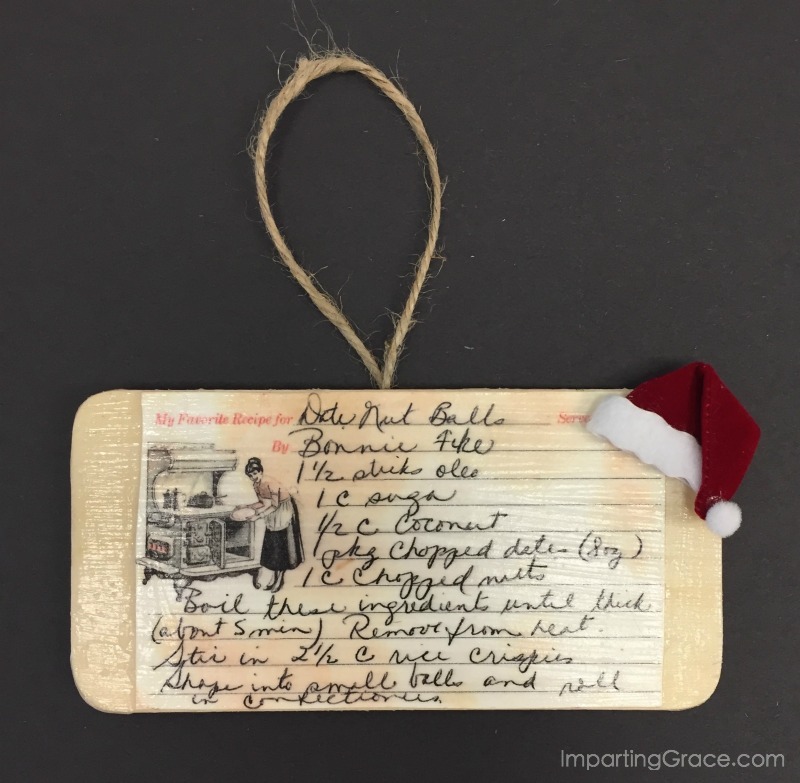 I love that you are making ornaments with your mom's recipes, Richella! And you've shown us how easy it is to do, too! I've seen baking themed Christmas trees for the kitchen and this would be a great ornament for those trees too! Thanks so much for joining us, Richella!! Oh, my mom died in 1996 at the young age of 64 from ovarian cancer. Even though it's been over 20 years, I miss her terribly. She was an excellent cook and taught me how to sew and garden and so many of the skills that I use today and are part of my blog. Last year I made tea towels for my siblings with one of her cookie recipes in her handwriting, so of course, I love this idea. I'm going to have to see what I have of hers that I can use for an ornament now. Thank you so much for sharing this great idea! Patti, my mom was just 58 years old when she died, so I understand your pain. It's been almost 18 years now since my mom died, and I still miss her! I am grateful that I'll get to see her again some day. And that tea towel idea? I've got to see that!! Love this idea! So neat! Richella, what a sweet, sweet ornament and a beautiful way to keep your mom in your heart and thoughts at Christmastime. She had lovely handwriting, indeed. I'm going to keep this in mind. I also love the use of Mo Podge to preserve it for long-lasting tree display. nothing beats handwriting of a loved one! This is so sweet and special! I love this idea. It is so special and makes a wonderful family heirloom. 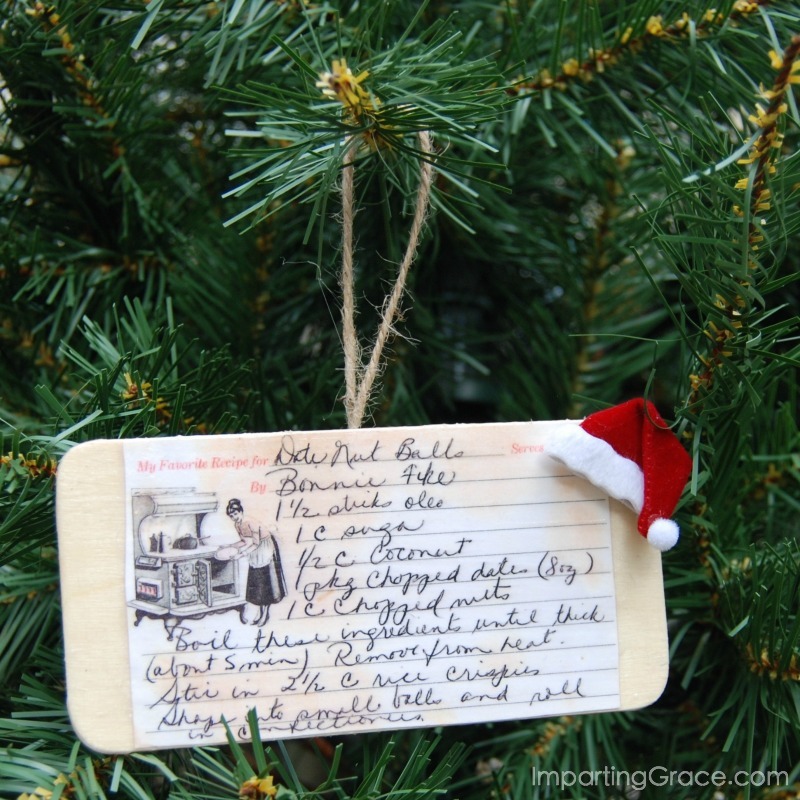 I have some hand written recipe cards from my grandmother too, so I love this idea. Pinned! I have a handwritten recipe that would be perfect for this, great idea! I have a thing for meaningful, sentimental type things. I can already think of a few recipes, notes, etc. that would make a lovely addition to our tree this year. Thanks for sharing this idea, you made my creative wheels start going. Oh my goodness! What a wonderful idea and such a lovely way to preserve memories. Richella, this is absolutely charming! Thank you so much for sharin. I have so many recipes written in the handwriting of those who have passed. You have encouraged me to have a tree in the kitchen displaying all of these, and adding one of my own for posterity. One of my favorite ideas I have seen ever! I couldn't think of a lovelier way to remember your mum at Christmas Richella. 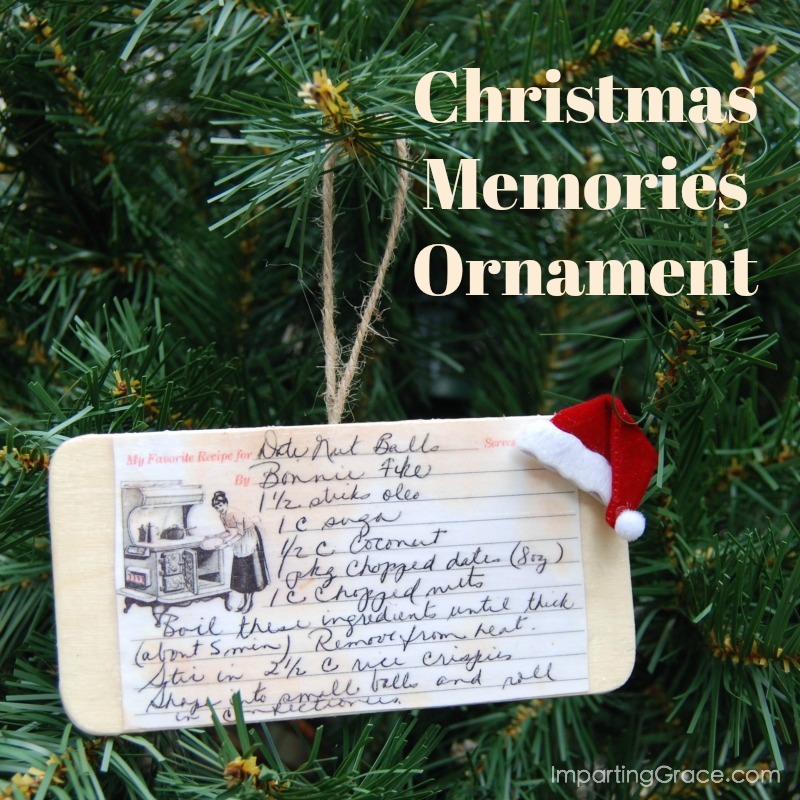 You must have so many wonderful memories every time you look at this precious ornament. I absolutely love this idea! I want to do this with my grandma's recipes! Thank you for sharing! I love, love this idea! So unique and creative. A keepsake to be treasured for generations! Richella, Thank you so much for sharing my post, it was difficult to write and I was so happy to be able to share the good news that followed the heartache. You are so appreciated. This is such a cute way to display those happy memories! Beautiful ornament! This is such a sweet, sweet idea. Love it. I think it would be awesome to do this with a little child's handwritten Christmas list as well. Such a sweet story about your mom. 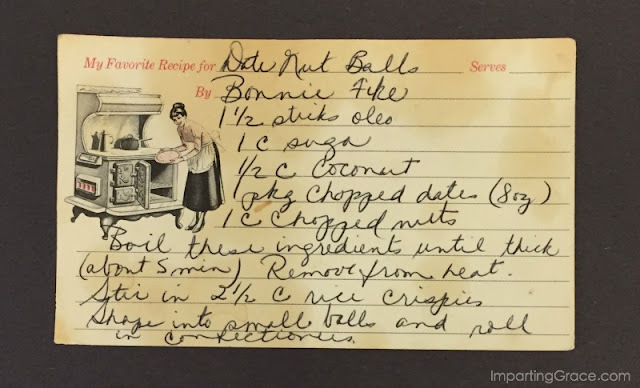 I hope you make this recipe every year at Christmas like she did.